Sometimes a long-held notion can be so strongly believed that history takes hold of it as the truth. One such case is the story of our bent, soot-covered Fisher Space Pen, on display in the Rotunda adjacent to the Apollo 9 “Gumdrop” Command Module. Most enthusiasts and casual students of the US Space Program are aware of the heart of the legend – marooned on the surface of the moon by a broken ignition switch, Buzz Aldrin and Neil Armstrong used good old-fashioned Yankee ingenuity to defeat the balky circuit breaker, firing the return motor to propel themselves back into space for the journey home. The smart ‘fix’ was to wedge a pen into the switch housing, completing the circuit and enabling a safe return. The world held its breath for the astronauts, but on the ground, an advertising writer knew gold when he saw it. 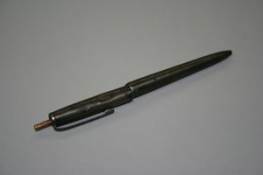 The Fisher Space Pen company immediately began selling their unique brand of writing instruments with the proud mention that their product had ‘brought the astronauts home’. And so, a legend was born – a persistent and flawed legend, but at its core a story that many can recite today, that Buzz Aldrin used a Fisher Space Pen to avert catastrophe. The truth is a little different, but with the passage of time, the myth is slowly overtaking the actual events. On that momentous day in 1969, Astronaut Buzz Aldrin knew he had a problem – looking at the moon dust collected on the floor of the Lunar Module after he returned from his first walk on the moon, Aldrin noted a small object that was out of place. Turning it over in his hand, he realized it was the top of a circuit breaker for the engine that would launch their vehicle back into space. After notifying “CAPCOM” back at Houston, Buzz went about finding a solution, even as a small army of engineers back on Earth sprang into action. While they worked their slide rules and pored over manuals, Aldrin dug around until he came up with a felt-tip marker – in a moment of inspiration, he realized that the non-conductive felt tip would close the contact without shorting it, or causing a spark. By the time a ‘fix’ was radioed up to the spacecraft on the moon, Buzz Aldrin announced that they were back in business. What the reader will note here is that the astronaut involved made a conscious choice when deciding which pen to use, and he chose the Dura felt-tip instead of the Fisher Space Pen. A small correction, but even today, people familiar with the “broken circuit breaker story” almost invariably credit the Fisher Space Pen with the successful return of Apollo 11. In fact, the legend has taken hold to the point that today, even other astronauts repeat the error when discussing “THE” pen. In the 1970s, the San Diego Aerospace Museum held several items loaned from NASA, including a dull silver pen with a small card, explaining how it was used aboard the historic first moon landing. The fire that ravaged our first facility destroyed 98% of the artifacts and holdings of the museum and everything was feared lost in the first hours after the building collapsed. In the days that followed, volunteers used metal detectors and sifted the ash and debris, hoping to recover some small amount of our losses. From out of the ash, someone found a soot-blackened pen from the area where we originally displayed NASA items, and it was with some relief that we were able to notify NASA that “THE” pen was not lost.